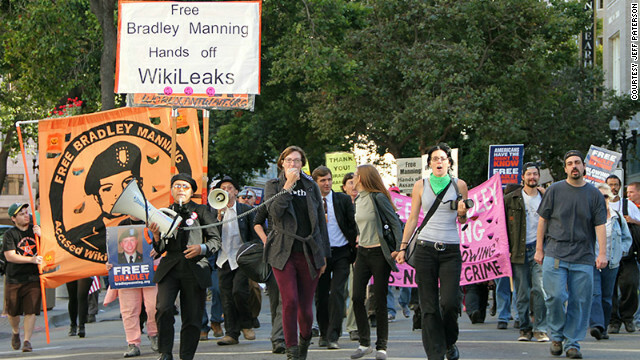 Protesters march toward the Obama campaign headquarters to demand Bradley Manning's release. Julian Assange made headlines Sunday by simply stepping onto an embassy balcony in London. The same day, the young man some say made Assange famous passed his 817th day behind bars. Army Pfc. Bradley Manning sat thousands of miles away in Kansas at Fort Leavenworth penitentiary. On a sprawling lot of farmland, Leavenworth is a historic place - once holding Al Capone and the George "Machine Gun" Kelly. 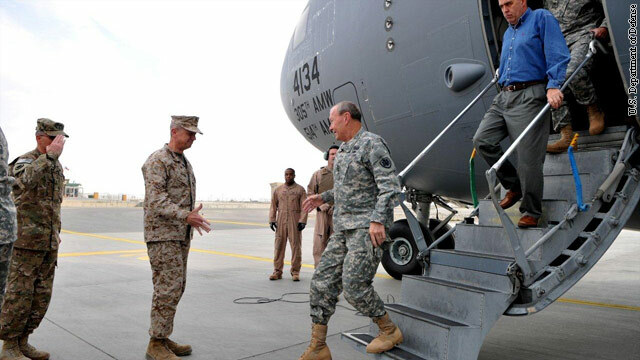 Joint Chiefs Chairman Gen. Martin Dempsey arrives in Afghanistan on the C-17 that was hit by shrapnel from two rockets. Shrapnel from rocket fire Tuesday damaged the plane that had carried the top U.S. military officer to Afghanistan, officials said. Gen. Martin Dempsey, the chairman of the Joint Chiefs of Staff, was in his room at the time of the incident and was "not in any danger," said his spokesman, Col. David Lapan. Dempsey arrived in Afghanistan on Monday for meetings with coalition and Afghan leaders, including Gen. John Allen, commander of NATO forces, and Afghan Army Gen. Sher Mohammad Karimi, Dempsey's counterpart in the country. The C-17 was parked at Bagram Air Field, outside Kabul, overnight when it was hit by shrapnel from two rockets, Lapan said. Two base maintenance personnel were slightly injured, he said. Is Iraq helping Iran evade sanctions? Iran's economy is supposed to be in a stranglehold from international sanctions, but U.S. officials say Tehran still has access to the international banking system – thanks to Iraq. The U.S. government is looking to the government of Iraqi Prime Minister Nouri al-Maliki to help stop any sanctions busting. Jill Dougherty reports.